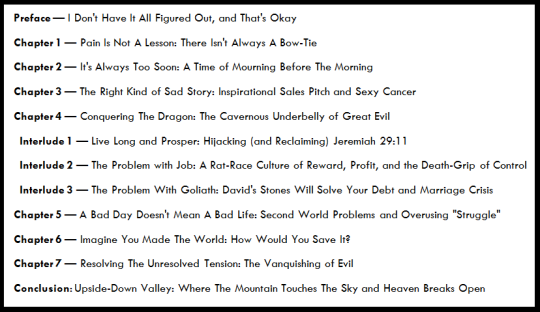 Table of Contents for My Next Book! This is the preliminary Table of Contents for my next book on trials and suffering. It’ll be out as early as February or late as March. I’m announcing test-readers soon! If you’d like to be put on the list now, please send me your email and I’ll be sending you a rough draft next week. The book also talks about: True Detective, Louis C.K., the Serial podcast, Prosperity Theology, the pressure to be “radical” and to do “great things for God,” overly inspirational Instagrams, The Shawshank Redemption, and a study on misunderstood passages like James 1:2-5 and Hebrews 12. Please send a prayer and love y’all! Previous Previous post: Merging For God’s Glory. Congrats JS. Can’t wait till I can finish my Book and Post the Chapters! It’s called A Struggle to Victory! I wish you the Very Best! Peace Be Unto You and GOD Bless! Jane. PS. Could you let me when I can get it, Please? Hi Jane! That’s awesome and congrats on your upcoming book. You can actually email me at pastorjspark@gmail.com and I’ll put your email on the list. I’m making an official announcement for test-readers next week but please feel free to email me today! Are there any requirements or preferences you have for your test readers? And, congrats…you are so inspiring in a down to earth kind of way. Thanks for letting God use you! No requirements at all! I’ll be sending a (very) short list of guidelines with the rough draft. Just send me your email any time!